Rare Vintage Walter Dexter Studio Canadian Raku Glaze Water Jar. Up for sale is a fine rare vintage art pottery Raku glaze lidded water jar by renowned Canadian listed artist / potter, Walter Dexter of Kelowna, B. The base is signed'DEXTER'. Please see photos below for more details. Measurement: The jar measures approximately 18 cm tall (from the base to the top of the lid) and 17.5 cm wide. Condition: It is in very good pre-owned vintage condition with normal wear commensurate with age. No chips, cracks or repairs. International Buyers - Please Note: 1. There is nothing we can do about it. Check out my other listings. The item "Rare Vintage Walter Dexter Studio Canadian British Columbia Raku Glaze Water Jar" is in sale since Saturday, September 8, 2018. 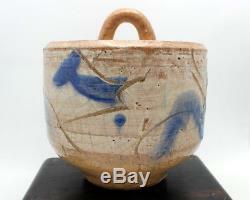 This item is in the category "Pottery & Glass\Pottery & China\Art Pottery\Other Canadian Pottery". The seller is "vtgcollectables778" and is located in Vancouver, British Columbia. This item can be shipped to United States, Canada.